Th-INK-ing of You: Welcome to the ODBD January Release! Hello everyone! HAPPY NEW YEAR!!! 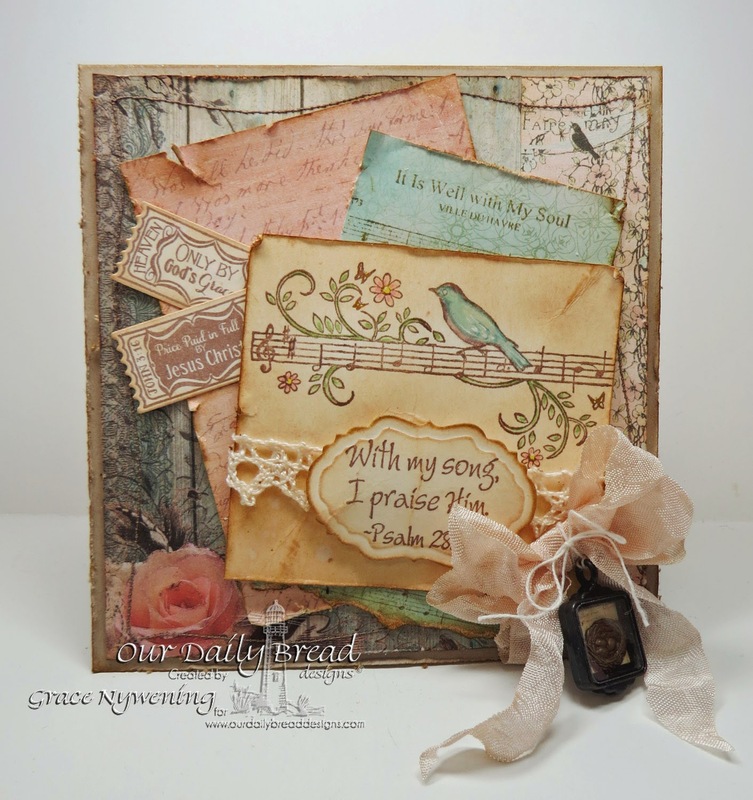 Welcome to the Our Daily Bread designs January release! If you didn't see the entire release, you might want to begin at the ODBD Blog. To be eligible to win one of THREE prizes of $25.00 Gift Certificates to be used toward the purchase of stamps at the ODBD Store, simply leave a comment on each of the designers blogs by Jan. 2, 2015, 9:00pm EST. Three winners will be randomly chosen from comments on the designers blogs and the winners will be announced on the ODBD Blog on Jan. 3rd. Be sure to check back there to see if you won! For the above card, I used Just a Note, and Faithful Fish Pattern Die, as well as previous releases: Vintage Flourish Pattern Die and Beautiful Borders. I began with a Regal Rose base top fold A2 card. For my background, I inked my fish pattern die with Worn Lipstick Distress ink before running it through my die cut machine. This put a little color in to the debossed pattern. Please note: This die is designed to deboss the fish and the dots around the outside border of the die, but I passed mine through the machine several times and then simply pierced my border holes out. I like the way it looks this way! I popped the fish pattern up with dimensionals, then added the pink Beautiful Border which I laced up with 1/8" ribbon. I popped up the image on the mat and mounted that on top of the fish pattern. I stamped the image with Worn Lipstick Distress Ink and then colored it lightly with Copics. I cut the panel with the Vintage Flourish Pattern die and popped that up with dimensionals on a Spellbinders Majestic Label Twenty Five. For my next sample, I went from fairly clean to shabby and distressed. For this card, I used Music Speaks for my image and sentiment. I stamped with brown Memento ink white card stock, and colored with Copics, then I distressed edges, crumpled up a few wrinkles and sponged with various distress inks. The sentiment is cut with a Vintage Label, and distressed, then popped up on dimensionals over the lace trim. The card base is Baked Brown Sugar, and the designer paper is g.c.d.studios - Botanique. I used a scrap of blue designer paper and lightly stamped the It Is Well With My Soul Hymn Background with Distress ink. I layered up my papers and decided to tuck in two of last month's tickets from Admit Three, and cut them with the ticket die in the Mini Tags Die set. I did my first "wandering" stitch technique on this card and I wanted to go a second time around but my machine was not liking this paper and I was afraid I'd ruin it, so I stuck to just one row of wandering stitches. My wrinkled seam binding also anchors a little bird's nest charm from Prima. Thanks so much for visiting today! Please stop by my DT sisters' Blogs to view all the inspiration they have to share with you! Both beautiful but I think the pink is my favorite. Love the fish background and the dies. Perfect. Happy New Year Grace!!!! I'm so inspired seeing your wonderful designs this month - no surprise there! Your first card blows me away. This is a serious beauty - the bright pink and touch of yellow in the image along with the die-cuts and beautiful simple floral spray all make it special. And your second card is AMAZING. Every detail on this shabby beauty is perfect. I see something new everytime I look! Thank you for all your inspiration throughout the year. Oh Grace, you never disappoint!!! They are beautiful, your style is so formal and precise, they truly inspire! Gorgeous work, Grace! I am loving this new release. Your shabby card is stunning- so well done. Love all of the layers and texture. Happy New Year! Happy New Year Grace!!! Oh my goodness! Your first card is so pretty in pink and white! The little rose buds are gorgeous! And your second card is so vintage and soft and shabby and stunning!!! Absolutely LOVE it! Your cards are so beautifully done, Grace. I especially love the layout and colors of the second one. Oh, Mrs. Grace, so beautiful as always. Can't wait to grab these sets. Love em all! Happy New Year my dear sister in Christ! Starting the New Year out right with these stunning cards. Love that first one, how you inked the die. And love the second shabby chic one too..
sending you hugs & blessings. Both of your cards show beautifully how we can use the new stamp sets. My favorite is the second with all the layering. Came to leave a comment on how lovely your sample card on Our Daily Bread blog was, only to find out your second card is even more stunning. That pink and all that piercing is gorgeous! Grace these cards are beautiful as always. I especially like the second card. Hope you have a Happy New Year! Praying for God's blessings on your life. Such pretty and feminine cards. Love them all. Grace, I love both of your contrasting styles and knew you would totally rock this release! 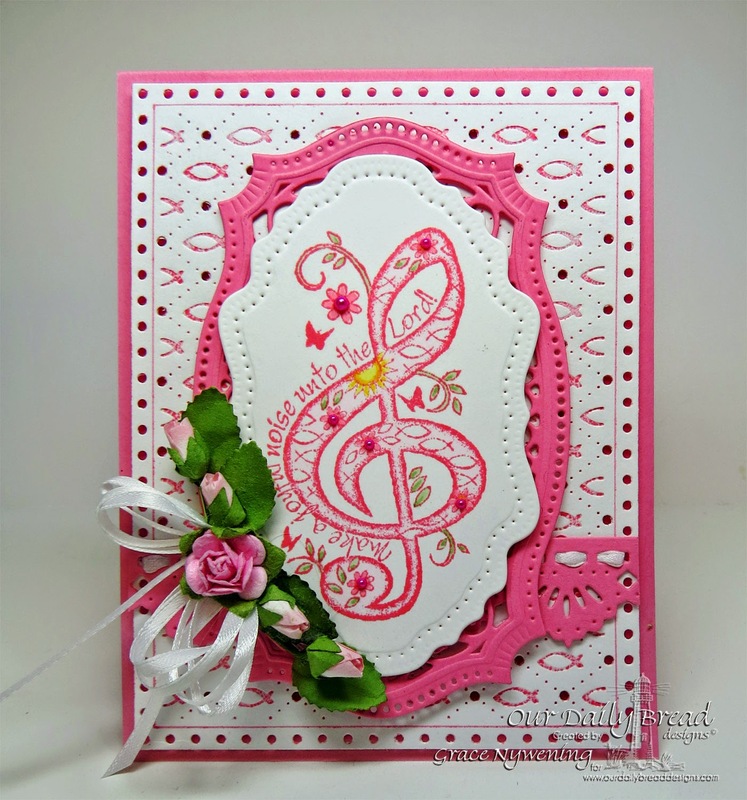 :-) Love the bold pink and white in the first - great colors to highlight this gorgeous treble clef! The distressed, grunge look in the second card is equally beautiful! Happy New Year Sweet friend!! Was able to get an internet connection long enough to comment!! Miss you!! Your cards are gorgeous as always!! I just love the trouble clef all in pink and the added flower detail and outlined fish!! The second has a very shabby chic feel. Have a great New Year's my friend! Love how you did the background on the first and the lovely flower arrangement to go with it, the second has a wonderful collage feel to it! Adorable cards, I love the sweet feminine feel of these. Wonderful new releases too. These are gorgeous cards! I love the brightness of the first one and the softness of the second. Great job! Happy New Year! Happy New Year and many Blessings. Love the cards, love the colors and the one sort of has the vintage look that I love. Beautiful! The vintage look of your second card is lovely! The bow and lace give a great look to this beautiful set. I love the music on blue. And the pink fish... Love them! Gorgeous, gorgeous cards....both so beautifully detailed...what a treat it will be for someone to receive these!! Love the pink on the first and the shabby, distressed layers on the second. I had just been thinking it might be nice to ink the fish background before debossing. I'm happy to see an example of it! Very pretty! Happy New Year! Loved both of your cards. Hi. Great cards and stamp sets. Thanks. Love the fish plate! May have to do some ordering after looking at all of these fabulous projects! Beautiful Grace! Love the crisp look an lines on the top card and the shabby vintage feel to the bottom card! Love your cards! Both are beautiful in different ways. Both of your cards are Beautiful! Grace, I am not often speechless, but your pink card has left me mute. But for gratitude. Thank you. Thank you for sharing your technique with the fish background and for sharing the card as a whole. I don't always leave a comment on your blog as I should. Oh, Grace, these are both amazing...and so different! I love the vibrant color of your first one with the beautiful "note" image and lovely flowers. And your second is shabby chic - wow! I love it! Both stunning cards! Wishing you a happy and healthy new year, sweet friend! Hugs! These cards are both beautiful. I love the letterpress look on the first one! Both cards are absolutely stunning my sweet friend. I love the tiny rose buds on the first card and shabby always speaks to me . . . .both are fabulous! You had some great toys/tools to work with, but you took them over the top with your designs and techniques. I need some lessons from you! Thanks for sharing! Oh wow Grace....this pink and white card is just gorgeous. I do love that treble clef and your design is beautiful. Happy New Year, Grace. I am so very happy that I found your site. I too, am a child of God. Your cards are gorgeous! I especially like the first one. I'm off to start at the beginning so I can see the entire release. Thanks for the inspiration. Hi Grace, Your cards are wonderful. Love the flower and ribbon accent on the first one. It's the perfect finishing touch. You shabby chic card is wonderful too. I try this style and often just end up with shabby. No chic. I'll be studying your card. ALso, I was asked to join the design team here. I was so very bummed to have to decline. I'm working on a manuscript with a deadline and couldn't make room. I was looking forward to working with you. Maybe another year. Your cards are a testimonial and I so appreciate that. More, More, More! Beautiful cards. I like the pink one best too. I enjoy visiting your blog and seeing all your creations. love the coloring on your cards. the first one is my fav. love bright colors. Love how you created the pink fish background and famed the beautiful treble cleft with the sweet flowers and frame. WOW, Grace…you've outdone yourself with this release! Love how you inked up the Fish Die for your beautiful background…love the pink with the pretty flowers. Your shabby card is just gorgeous…love the vintage look. Different styles, but both equally beautiful! Have a wonderful and blessed new year…hugs! Oh these are both so lovely!! I like how you used the faithful fish die on the first one! Lovely cards. The second one is my favorite - I love the delightful layers. Beautiful cards, Grace! I am really liking that large treble clef. Beautiful!! Love the colors you used on both. Hi Grace. Happy New Year. I love how you used that fun pink, made it elegant and with a purpose. I do love all the layers on the second and that sweet bird. LOVE the pink card!!!!! And the shabby chic card is so beautiful!!! Happy New Year!! Love them both, Grace!! The pink card is so cheerful and gorgeous....love the flower spray with the ribbon! The 2nd is a shabby delight....I need to take some lessons!! Fabulous job on both!! HUGS!! Both beautiful cards...I love pink (My favorite color!) and I really like the "shabby" look...so you know I really like these.